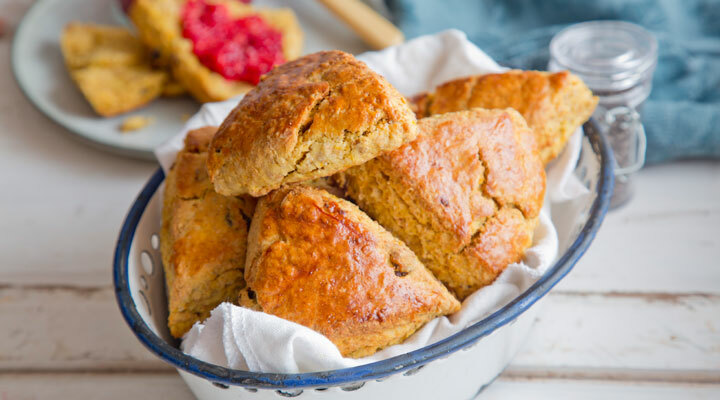 These scones are a great way to get the goodness of sweet potato into any fussy eaters, as most likely they won’t even notice it. If you don’t have a food processor, these can be made by hand. In either case, ensure the purée is really smooth before adding it. Steam the sweet potato for 8 to 10 minutes, until tender. Once cooked, blitz the potato in a food processor until really smooth and leave to cool. Spreading it out on a plate or baking tray will speed this up. Preheat the oven to 200°C/gas mark 6. Line a large baking tray with non-stick baking paper and set aside. Briefly whizz the flours and butter together in a food processor to create fine crumbs. Tip into a large bowl and stir in the raisins and baking powder. Make a well in the centre. Break one egg into a large jug or bowl. Add the milk, honey and orange zest and whisk together. Mix in the cooled sweet potato purée, then pour this into the well in the dry ingredients. Mix everything together until well blended into a soft, slightly sticky dough. Divide the dough in two. Lightly dust a clean surface with plain flour and knead one half of the dough into a neat ball. Roll it out until it’s about 2.5cm thick, keeping the round shape. Using a sharp knife, cut into six even-sized wedges and arrange on the tray, spaced well apart. Repeat with the remaining dough. Beat the remaining egg in a small bowl and brush it over the tops of the scones. Bake in the oven for 15 minutes, until golden and crisp on the outside but cooked through. Leave until cool enough to handle. Serve warm or cold, spread with a little butter if liked. TIP - Make a few batches of the sweet potato purée at once and freeze in 175g portions, ready to defrost the next time you want to make these. - These are delicious served with a homemade sugar-free chia jam. Simply mash or blend 125g fresh raspberries, strawberries or blackberries in a small bowl. Stir in 2 teaspoons of chia seeds, cover and refrigerate for at least 1 hour to thicken. Stir in 1 teaspoon of honey to sweeten if liked.